Some researchers are trying to find out what will help increase student voting. This past February, when many of their peers were still asleep, a group of Tufts University students got on a bus to New Hampshire to take advantage of a once-every-four-years opportunity: seeing presidential candidates making their final pitch to voters. Research shows that campaigns that directly contact young people boost youth turnout. Knocking on young people’s doors to talk about an election increases their turnout by about 25 percent. Tufts University’s Tisch College has been analyzing data on youth voting in every election cycle since 2002. Our research consistently shows that young people respond well when they are invited to participate. Why Are Millennials So Connected, but Apathetic Toward Politics? While taking a bus to a primary state offers a great opportunity, it’s not an option at most campuses most of the time. As the dean of a leading institution on civic engagement and political participation, I see clearly that raising the national youth turnout – and increasing political learning, generally – requires a broad range of strategies. Why care about young voters? Young people have the power to shape elections. They represent a major potential political force: 49 million young people, ages 18-29, are eligible to vote – more than the 45 million eligible seniors. Their collective power is such that in 2012, if Republican nominee Mitt Romney had obtained just 50 percent of the youth vote in Ohio, Pennsylvania, Virginia and Florida, he would be president of the United States. Already this primary season, young voters have made a significant impact in states like Iowa, New Hampshire and Nevada. On the other hand, young people’s potential to shape elections goes largely unfulfilled. In 2014, only 19.9 percent of 18- to 29-year-old citizens said they voted – the lowest youth turnout rate ever recorded in a federal election. While youth participation is always higher in presidential years, we are seeing a decline there, as well. In 2012, youth turnout was 45 percent, down from 51 percent in 2008, according to an analysis by the Center for Information & Research on Civic Learning (CIRCLE), which is part of Tisch College. What then are the solutions to this declining participation? First, there are many misconceptions about youth. Campaigns and candidates often treat the youth vote as a monolith. Indeed, young people are a highly diverse group. For example, only about 29 percent of young people are college students, and nearly 20 percent of young people are parents. Their experiences and life circumstances influence how these different groups are likely to engage politically. For example, issues like early childhood education may be just as important as the cost of higher education. Youth turnout and choice of candidates also vary by race, gender and immigrant status. For instance, African Americans under the age of 30 voted at a rate of 53.7 percent in 2012, whereas the turnout of young Latinos was 37 percent that year. The gap in turnout between college and noncollege youth is particularly large. In 2012, young people with some college experience were almost twice as likely to vote as those who had not attended college. Even among college students, there are disparities in political engagement. The National Study of Learning, Voting, and Engagement (NSLVE), which was started at Tisch College in 2013, is collaborating with over 800 participating colleges and universities in 48 states to build a database to study voter registration, voting patterns and correlations with campus climate and practices. Data from the 2012 presidential election, for these enrolled colleges, show that education majors voted at a 55 percent rate; engineering and math majors at 35 percent. Universities across the country have been trying to better understand these patterns and improve college student turnout. So what do we know through this research about how to motivate young people to go to the polls? First, registering can be a challenge for young people. In the 2008 election, 84 percent of youth (ages 18-29) who were registered to vote actually cast a ballot. In 2012, of the young people who weren’t registered, 17 percent said they had missed the deadline and another 7 percent said they did not know where or how to register. 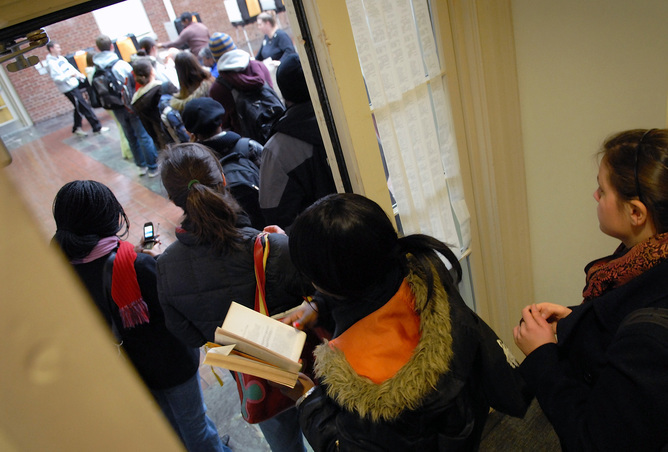 Many college students, in particular, are first-time voters who move frequently and must decide whether to vote in their university communities or in their home states. Second, discussions and debates are important for young people. Evidence from national surveys shows that young people are more likely to vote if they have discussed current events in school, at home or with peers. The role of faculty in connecting political issues and policy debates into curriculum and pedagogy can be critical. Third, providing basic information about voting makes a difference. Having information about how, when and where to register and to vote can help young people feel prepared to cast a ballot. Technology and social media can be helpful in disseminating information and promoting political discussions. Universities can create programs that encourage students to register and build excitement and interest in an election. For example, at the historically black college in North Carolina, Livingstone, an event that created a fun atmosphere with music, prizes and free food, as well as candidate presentations, resulted in the registration of nearly 400 of the school’s roughly 1,000 students in the 2008 national election, according to a report by Democracy North Carolina. Similarly, Tufts University has taken steps to encourage voter registration, partnering with TurboVote, a product of Democracy Works, a nonpartisan nonprofit, to encourage students to register online and sign up for text alerts with important voting reminders. Tufts also is collaborating with a broad range of campus groups on voter registration drives, rides to the polls, issue forums organized by students and other outreach activities. Tufts President Anthony P. Monaco recently emailed the entire student body, staff and faculty with a reminder to register and vote. On other campuses too, students have organized events to encourage students to vote. At the University of Houston-Downtown, the student government organized a “Walk 2 Vote” initiative in 2012 and 2014. Creating the “buzz” attracted students and local youth. They are now trying to replicate this on other campuses. Research shows same-day registration, automatic registration, preregistration for 16-year-olds, a lower voting age and stronger civic education in schools all could boost youth turnout. The fact is that voting is habit-forming and is often a gateway to other forms of civic engagement. At a time when young people face enormous challenges – crushing student debt, unemployment and mass incarceration – supporting them to vote will help raise a new generation of citizens who actively engage in our democracy.